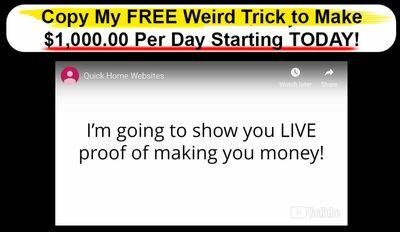 Stumbled upon this program that promises $1000 per day starting today, by simply copying Jake’s free weird trick? Wondering does Quick Home Websites scam you? You have landed at the right place. Welcome to my Quick Home Websites review. If something sounds too good to be true, it usually is. And I’m really glad that you are taking the time and effort to sniff it out, rather than just taking what they say at face value and buying into it. You really can’t be too careful, especially with the amount of scams going around the internet these days. And even more so when someone offers some done for you system that requires minimal work on your part, and yet allows you to earn the big bucks fast. You’d better run off in the opposite direction! That person is obviously trying to scam you. 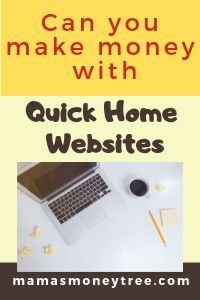 Here in this honest, unbiased and in-depth review of Quick Home Websites, we will take it apart, to expose the truth behind the glittering facade, by pointing out all the red flags and why the only person this will work for is “Jake”. Quick Home Websites uses dishonest marketing tactics to lure people into buying the product. You will not make any money from this, firstly because you will be promoting scammy products like this one, and secondly they do not teach you how to drive high quality free traffic to your affiliate offers. Read on for the detailed review of Quick Home Websites, and why I call it scam. Apparently Jake had already turned on your account, and you were already making money as you were watching the video! Wow. How believable. He is unlike those scam artists you find everywhere on the internet. He is offering this opportunity to you, as he knows you have been trying to make money online, but have failed and failed. Look, his websites have already made him $10 million in the last 4 years! Now, all you have to do is to sign up with him, and simply check on your accounts every now and then to make sure that the money is coming in. Don’t worry about all the work and technical stuff, Jake has taken care of everything for you. He can’t share with you how his method works in this public video. But you can be sure he’s not a scammer because he is not telling you that you can earn a million dollars overnight. $1K a day from the internet is an easy and realistic number because he has the right system that works. He needs to put 15 more people on his websites. So you are in luck. And look, as you were watching the video, you already have $135 sitting in your account! This is live proof of how powerful Jake’s websites are. And so he goes on and on, baiting you with all the money, but never once letting you in on the exact method that he will be using. Is it even possible that such a fantastic offer like that exists? Someone does all the work for you, while all you do is collect the money? It is pure nonsense, that’s what it is. He has not shown his face throughout the entire sales video. We do not even know his last name, and how he looks like. If he is such a successful multi-millionaire, why doesn’t he dare to reveal himself? Why are there no social media accounts of his that we can try to link up with? The truth is, Jake is just a scammer. Not revealing his real identity makes it easy for him to run away when people come chasing after him for scamming them. The only way he makes money is when people buy into his lies, and pays him $37 each to try to make money through his websites. You will be promoting this Quick Home Websites, and some other equally scammy products, as an affiliate. When people buy through your affiliate links, you get to earn a commission. Which means you will be selling this nonsense to people. That is, if you can even get traffic coming through to your offers in the first place. The websites you get are not functional. They are simply single page sites, promoting the very product that you are being sold to right now. To make any money out of it, you have to know how to drive traffic to your ‘websites’, either by spending even more money to buy other people’s email lists, or to pay for advertisements on platforms like FaceBook, Google Adwords, etc. Without the experience of knowing your customers and knowing the platforms well, you will end up in much greater debt than before you started off. Moreover, this is an unethical way to make money, by trying to get people to buy sketchy products like this. This is the best part. First they tell you that you can make $1000 per day with this. Then they say the typical purchaser does not make any money using this system. Interesting, isn’t it? And this is written in barely readable (because of the fade-in colours they use) text, right at the bottom of the sales page. You may have to increase the brightness of your screen in order to see it more clearly. Would you buy a product like this? 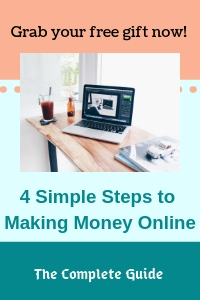 The internet is a great place to make money because it gives you the flexibility to work from home or anywhere else on the planet as long as you have a computer or laptop and an internet connection. Unfortunately, it is also the breeding ground for scams, because everyone is looking to get rich quick. So scammers target this weakness of human nature, of wanting easy money fast, with minimum effort. You can recognise a system or product is out to get your money when it is a shiny object. Let me bring you back to Earth. The internet is full of opportunities. But it will only work for you if you work for it. Always remember that success never comes easy. If you want any success on the internet, it requires time and lots of effort. Behind every successful internet marketer is the unspoken months and years of toiling, failing, making mistakes, learning, and persevering. If you can accept that, then let me show you what I think is the best way to make money online. I chose this business model because to me, it is neat and hassle free. It is affiliate marketing, but done honestly and properly such that it adds value to people’s lives, instead of cheating on them. 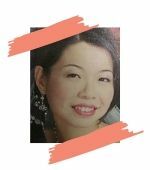 By promoting great products in my chosen niche that I have a strong conviction in, I earn a commission when people buy the products through my affiliate links. The traffic method I use is totally free. It is also of the highest quality, that converts into buyers with the highest rate. By virtue of my traffic method, customers come looking for me, instead of me having to go out to look for customers on social media or any other advertisement platforms. This is a sustainable and profitable way to start earning an online income, since it is very low cost, and is strongly recommended for beginners who do not have excess cash to start with. This basic refund policy is in place, for people who are dissatisfied with the product. Sadly, this is the only plus point I can think of for this product. There is no way I can trust this product if the real owner does not show himself or herself. 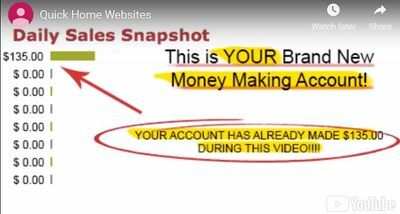 There is no account that is already making money for you as you watch the sales video. 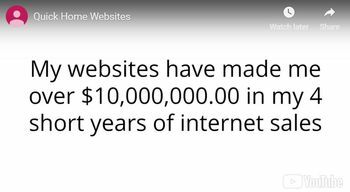 Similarly, there are no websites owned by “Jake” that has made him $10 million in 4 years. Making money online does not work like that. But scams do work exactly this way. The cost does not stop at $37. That’s just a start, a relatively low amount to lure you in, with the hope of making $1000 a day. Once you purchase the front end product, even before you get a chance to try it out and see if it works for you, you will be bombarded by a series of pricey upsells, easily adding up to hundreds of dollars. Those are equally useless to you, but these people know that you tend to buy even more stuff when your wallet is already out of your pocket. And frequently, these are one-click upsells that are non-refundable, since they just obtained your payment details through the front end product, they actually do not require you to enter them another time. So do be careful when you are sent through their sales funnel after your initial purchase. Is Quick Home Websites Scam or legit? In my opinion, the Quick Home Websites scam is real. It is useless to you in your make money online journey, just like these products that I have reviewed before: RankFlux, Cash Grab, and OnPoint 2.0, to name just a few. I absolutely do not recommend Quick Home Websites. If you want to make some serious money online, first you have to accept that you need to put in some serious work. If you do, I can show you how I am earning my online income, that is allowing me to work from home full time. This business model has produced countless successful affiliate marketers, who are making 5 figure monthly income. But, it does not come without hard work. You can build up an empire for yourself, if you are determined enough to make it work. The best part is, there is actually a top-notch training platform that provides step by step easy-to-follow instructions for newbies to establish their own affiliate marketing business, from scratch, just like what I did. If you have any concerns or questions regarding this Quick Home Websites review, do comment below, and we will start a conversation from there. Do the Legendary Marketer Reviews tell the real story?